Old Linux kernels can take up a considerable amount of disk space. Apt ("sudo apt-get autoremove") tries to remove uneeded packages, including old Linux kernels, but it may fail to remove all of them. Apt may fail to remove old Linux kernels when using an Ubuntu version that's under development, if you encounter THIS bug (which still occurs in Trusty), or if you've installed the kernels manually. There are various commands out there for mass removing old Linux kernels, but they complicated (and hard to remember), and not all are safe. 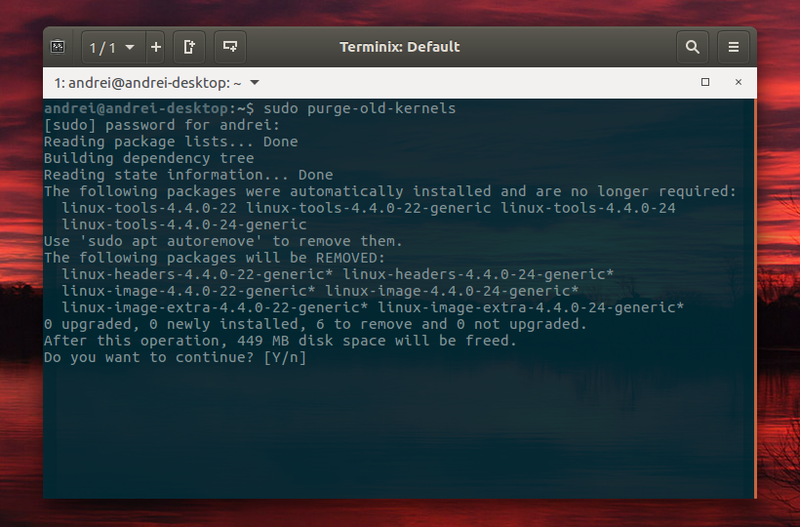 So what's the safest way of mass purging old Linux kernels in Ubuntu? Well, according to Dustin Kirkland, it's the "purge-old-kernels" command. The purge-old-kernels man page mentions that the command will never remove the currently running kernel. Also, by default, it will keep at least the latest 2 kernels, but you can override this using the "--keep" parameter (for instance "--keep 1" to only keep 1 Linux kernel).